I participated in a couple of sock swaps and one knitting swap recently. For the sock swaps, the participants knit socks and then "swap" them with another knitter. I completed two. I was suppose to do 3, but the other person didn't complete hers, so I decided we were done! 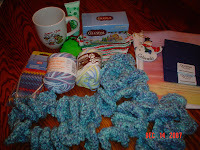 I also participated in a Christmas knitters' swap. We had several "components" to gather together. The person I was supposed to send my gift to was in Northern Europe. The picture on the right is what I received from a knitter in Colorado. She was quite generous! I love the scarf!